Finishes on western red cedar. 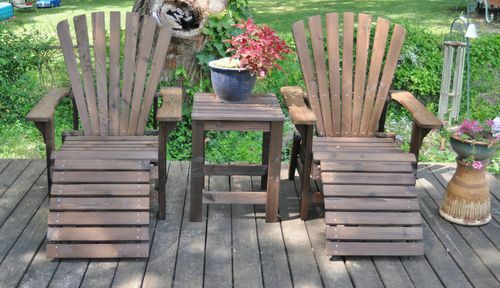 I make Adirondack furniture from western red cedar and so far I have not found a chemical finish that will hold up more than a couple of years. The reason seems to be that the cedar has a lot of surface wood that is just not very hard, and rots away with ultraviolet light and moisture. You can’t do anything about it economically if you want to make any money selling chairs. This year I’ve been burning them or charring them with a roofing torch which removes the softer wood, and gives it a texture. 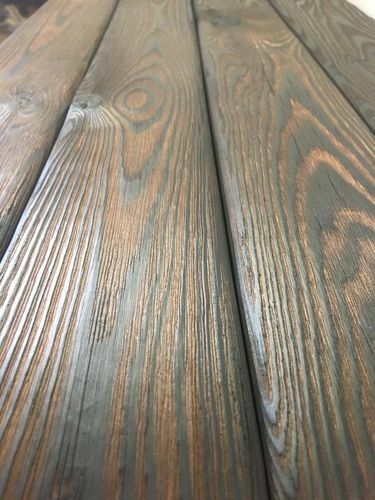 With the soft wood gone, the finish should stay looking nice and dark brown for a while and it’s aging will be much more graceful than chemical finish decay. I know many of you have just the thing for western cedar, but remember, I’m not just making one chair but rather hundreds, so I can’t spend $50 on a finish for one chair. I’ve tried all the deck and fence finishes, all the ‘woodworker’ finishes, and nothing stands up to time. All wood is sanded even before applying. They get two coats. Two years later they look like hell. So this year I’m trying this finish. Takes a lot of time and work, but that I got a plenty. I’m one of those that loves WRC I don’t bother put anything on the wood.If someone doesn’t like the way Cedar ages I suggest paint. Your chairs look like a good option. Zar outdoor poly. I bought a gallon and sprayed a cedar piece and so far so good. 3 years. The only problem I see with it, is having to sand the darn thing to put another coat on it. You know, mahdee, I think it’s just the cedar itself. From some of the chairs I’ve kept I’ve noticed that the wood itself has disintegrated under the finish. Like I said, I can’t afford the time for multiple coats and I don’t spray to avoid waste and to keep things around the house pollution free. That’s why this Yakisugi finish is ideal. I don’t think you even have to use any oil on it. I advise my customers to use a thin watery waterproofer on them at the beginning of the year. Puts the dark back into them and offers some protection, but nothing protects from the sun except shade, so I encourage covering them when not in use else the sun will destroy them. Aj2, this is pine, but just look at the texture and color it brings out. Even cheap pine plywood looks interesting after Yakisugi. Only heartwood is rot resistant and many outdoor woods (like cedar or cypress) are harvested before the tree can grow large which means most of the available wood is sapwood and will rot. And because it’s so soft, it rots pretty quickly. Few years ago I was going to buy some cypress and one of the dealers told me not to bother, it’s all sapwood he said. I ended up buying Eastern Red Cedar, there is no bullshitting with it. Redecked my boat and it’s going strong, no finish except a deck sealer. I hope you will continue to provide updates on this process! FWIW Western red cedar is a known carcinogen and you should treat sawdust as HAZMAT.